The email embraced “the right of every member of this community to engage in protest,” noted that “threats, coercion, and overtly disrespectful acts” are “unacceptable,” and praised the “affirming and effective forms of protest” in Monday’s march. This can best be read as a well-intentioned effort to assure students, faculty, and alumni that the University administration is on top of the problem. But what, exactly, is the problem? According to the email, the problem is how to “increase, support, and respect” Yale’s “diversity.” Just before Halloween, Yale’s “intercultural affairs council” emailed students urging them to select their Halloween costumes with sensitivity to the feelings of minorities. Those with a sense of humor will enjoy this earnest email. In response, Erica Christakis, who is associate “master” of Silliman, one of Yale’s residential colleges, emailed its students. Combining common sense, respect for students’ maturity and moderation, she urged students to decide for themselves on appropriate costumes and if they found one offensive, either speak about it directly to the offender or ignore it. This advice, ostensibly, is what unleashed the students’ fury as they vilified, traduced, and sought to intimidate the Christakis’s, Erica and her husband Nicholas, “master’ of Silliman, demanding their resignations. According to a Yale Daily News observer, “This man was surrounded outside his own home by dozens of students, who called him “f—king disgusting.” They jeered, in clearly implied threat, ‘We know where you live.’” Here are some other points that I wish the Salovey-Holloway email had made in the strongest possible terms. 1. 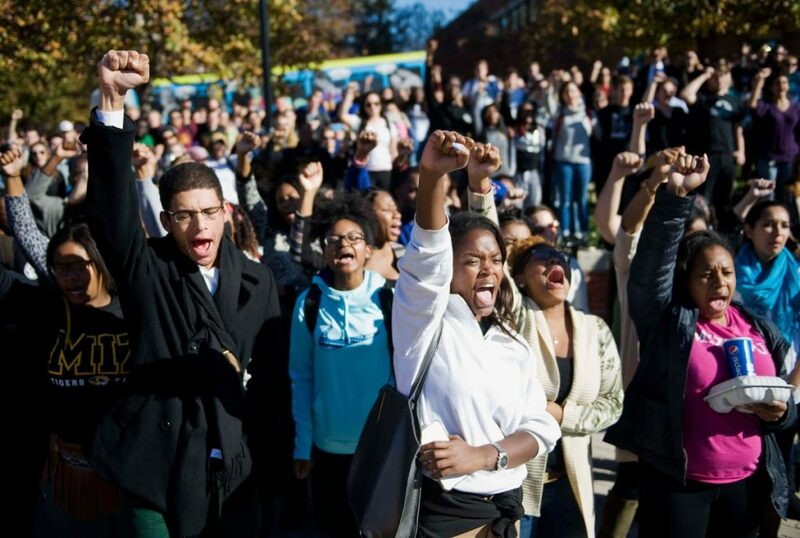 The fact that students complain of rampant racism on campus does not mean that it is true. Yale — and virtually every other old institution – countenanced racism and even practiced it, but that period is long gone. Indeed, it is hard to think of an institution that tries harder than Yale does to make students of all backgrounds feel at home, an effort underwritten by a recent $50 million commitment to increase diversity there and by the support of four ethno-specific cultural houses. Much the same is true on other elite campuses. Yes, Yale calls its residential college leaders “masters” and, contrary to student protests, this title is entirely benign, not a vestige of slavery, as some seem to think. (Whether Calhoun College should change its name in light of its eponym’s defense of slavery is a more serious question). Historical context – how and why earlier generations saw the world as they did — is part of the moral reasoning process that a university teaches. Condemning what now seems like obvious racism, while entirely appropriate, is the easiest part of such moral reasoning, requiring little insight. 3. Students state (or shout) many grievances, often in the form of slogans. Some are plausibly justified, others are gross exaggerations or simply false. Some seek genuine dialogue; others seek power grabs and shakedowns meant to foreclose conversation. The university community should demand to know the factual bases for those grievances, examine them on their merits, remedy them if warranted, and reject them if not. Reflexive mea culpae may buy temporary peace and goodwill but only invite more extreme demands. As Yeats warned, passionate intensity can undermine both truth and civility. 4. Mob psychology, whether created by students or others, is a kind of crypto-violent form of politics using shouts, threats, and lies as weapons. Honeyed words and apologies cannot mollify it. It thrives when it does not get its way, and failure simply confirms its grievances. The hostility to reason negates the university’s very purpose. Salovey, an eminent psychologist, surely knows all this but has not said it. Among this psychology’s other tics, it fastens on stupid, hurtful comments by fools and bigots (perhaps not even members of the university community, ascribes these views to many others who in fact condemn them, impugns the university for tolerating racism, and excoriates those on the sidelines as equivocating enemies of the cause. But every community has fools and bigots and must deal with them in its own way. Yale, a community of trained skeptics, eschews authoritarian solutions to questions of truth, relying instead on open, disciplined discourse to discredit error – even as we know that some of this discourse will itself be false. 5. America’s diversity is one of its greatest gifts to the world, and institutions like Yale are right to seek and protect it. But how we define and implement diversity is crucial to its real value in campuses, workplaces, politics, and elsewhere. Getting diversity management right is difficult; good intentions can easily backfire. Diversity in America: Keeping Government at a Safe Distance. Racism, sexism and other odious isms obviously exist, and we should firmly reject them. But combating these isms is especially hard for a university. They are ill-defined and based on subjective intent, so reasonable people disagree about whether they exist in almost any particular case. For the same reason, an accused cannot disprove them. Because many attributes are distributed differently among different groups, and because generalizations are useful, indeed inescapable, it is often unclear – even to the Supreme Court — when a judgment is just a useful generalization or instead reflects invidious bigotry and hostility. This ensures lots of false positives and false negatives. One who feels victimized by an ism resents being told that he is over-reacting and mistaken. His hurt seems like proof enough of intentional harm. On the other side, being falsely accused of an ism today is equally or more damaging socially than the hurt or indignity felt by the complainant. 6. University officials like us bear some responsibility for the aggressive, obsessive ethnic emphasis practiced on our campus. Through some mixture of cowardice, complaisance, and genuine conviction, we cater to the sensibilities of the most outspoken, politicized students by donning a kind of “kick me” sign. In this identity politics, students have strong incentives to dramatize their wounds as proof of the authenticity of a larger, more heroic social agenda — here, the extirpation of isms. 7. The only way out of this gyre of recrimination and misunderstanding is to cultivate two qualities that are sorely lacking in diversity discourse on campus: candor and thicker skins. On campus, candor should be the easiest virtue, but in fact there is remarkably little of it. Few are willing to concede the deep tensions among diversity, liberty, and equality – and thus the costs to precious values of one position or another. By thicker skins, I mean that we should cultivate a capacity for greater resilience, not greater delicacy. As one commentator put it, the U.S. today has become “a world of endless slights.” (Even that comment will elicit anger for suggesting that putative isms are merely slights). This is corrosive in a society as diverse, interactive, plainspoken, casual, and freewheeling as ours. It chills personal interactions by denying them the lubricating pleasure of spontaneity. It discourages candid discussion or artistic expression on vital public issues. It enlists formal and informal sanctions in order to reduce what should be robust give-and-take. It invites us to open our wounds, magnify our fears, and parade our sensitivities, to imagine injuries and motivations that do not exist and to view others, without basis, as enemies. It rewards cant, hyperbole, and reductive rhetoric while penalizing moderation and reason. It encourages us to seek security in groups of people who look, think, or worship like us rather than to venture out in the more diverse public square where our common citizenship is forged. It makes a mockery of rules that are brandished to penalize what is often just ignorance, boorishness, interpretive confusion, ill-considered speech, clumsy provocation, misjudgment, rough or poor humor and other unfortunate infelicities. 8. We do better to respond to such conduct with constructive engagement, forceful rebuke, pointed rebuttal, and mental shrugging of shoulders and biting of tongues. It is unfair that the people who need the thickest skins are often those who already feel under siege. Two factors, however, can help palliate this unfairness, if not assuage their hurt and indignation. The informal social norms condemning hateful attitudes and conduct are stronger today than ever before. And the alternatives to developing thicker skins are all unappealing, unconstitutional, or unworkable. Peter H. Schuck is an emeritus professor at Yale Law School. His most recent book is, “One Nation Undecided: Clear Thinking About Five Hard Issues That Divide Us" (Princeton University Press). Michael Meyers claims that universities are not working on cultural diversity on campus? Such a ludicrous statement reflects upon the New York Civil Rights Coalition that its Executive Director is as clueless as the leaders of BLM. Racism amd Sexism are not prevelant of campus. Student and faculty focus on proving relativity theory, or pinpointing chromosone defects continues to capture the essence of College Education. Publicity hounds like the book promoters at CNN, Fox, NBC, along with agitators like BLM, Rainbow Coalition, and SEIU garner the attention of organizations like Mr Meyers’ . I suggest paying more attention to solving real problems instead of the false ones promoted by our Divider in Chief POTUS. Outstanding! Thank you for saying this. Thank you Professor Schuck for a voice of reason that Yale Law School graduates have been waiting to hear. The problem with just saying “grow up” is that it’s as vague as the charges leveled by the students. They have no more idea of what that really means to them than anyone watching them knows about their real complaints. Thank you for a voice of reason. To me, this turmoil looks like a mini- Cultural Revolution. At first, I though the whole thing was satire. They are serious. Deadly serious. The students’ certitude is chilling. Bless people who have doubts about their actions. I have read up on Microaggressions (microabrasion is more apt) which seems to be the intellectual wellspring of these claims of injury. I love the proposed cure to end microaggressions; reeducation for all whites. You Sir/Madam are the enemy of confusion everewhyre! I mostly agree with Peter Schuck’s viewpoint but stongly disagree with his suggestion that colleges and universities have been working to support diversity on campus (and improved race relations) through their policies and practices of offering so-called “ethnocultural” dorms and identity/affinity housing. Indeed, what the colleges are actually doing, in the guise of promoting improved race relations, is practicing racism by organizing and making assignments to dorms by race and cultural group identity, including staffing such dorms with RAs who match the skin color or ethnic background of the identity house. That’s a bowl full of wrong. Such separate housing by race and/or ethnicity is the college indeed practicing racism by means of encouraging racial identity rather than respecting every student’s indivuality. Colleges that foster ethnic and affinity dorms and thier ilk are wittingly or unwittingly (I think wittingly) contributing to ethnic and racial Balkanization on campus and thereby facilitating frayed race relations; such “ethnocultural” and racially identifiable housing only reinforce racial stereotypes and supposed skin color “differences” among us. It also falls right in line with the grievance industry and race fanatics’ agenda on campus. Places as “liberal” as Yale ought to know better but they engage regularly in and fund racial separatism and paternalism, which is a form of racism. Another example of modern-day racism on the part of the ivy league and other major academic institutions is what is occuring at Boalt Hall, The University of Berkeley Law School, where officials have stopped the random assignment of iL studnets and begun assigning 1L students by race to “mods”/sections so as to cluster racial minorities in ways to have them feel better about “themselves” by being in groups where more of them have the same skin color. This kind of deliberate clustering of racial minorities, like “theme” dorms around ethnic and racial identity, are sick and regressive policies that regard individuals as racial entities rather than insist that all persons are treated as indiviuduals. Michael Meyers, executive director, New York Civil Rights Coalition. As a founder of Yale University Women’s Organization in the 1960s, another time of turmoil, I can speak with experience about the willingness and encouragement Yale supplied to help us organize and fund the effort. Katherine Angell and Mary Louise Brewster opened their homes for our organizational meetings. Yale Secretary Reuben Holden gave us a grant to support our activities. Many venues on campus were made available for our meetings. No one said no to us. and faculty wives. Our first year of programming included guest speakers Margaret Mead, Lillian Hellman, Betty Friedan, Robert Penn Warren, etc. We built something new, and just a few years later, women were admitted to Yale as students. It is easy to throw bricks. It is harder and takes longer to use those bricks to build a structure that can effect change permanently. I think this is the message Yale can and should deliver.